Red Lobster is in the upper echelon of all the chain restaurants, as it generously offers many dishes featuring lobster (and crab legs), all luxuriously featured on its brightly colored, laminated menus, alongside any number of tropical, umbrella-ed drinks. We at The Takeout even recently discovered the mix for RL’s addictive Cheddar Bay biscuits at the grocery store and were so excited, we not only made the (excellent) biscuits, but tried to make fried chicken out of the mix. Turns out Red Lobster likes that Cheddar Bay mix as much as we do. Although this dish apparently has been available since Lobsterfest kicked off in January (and nobody told us! 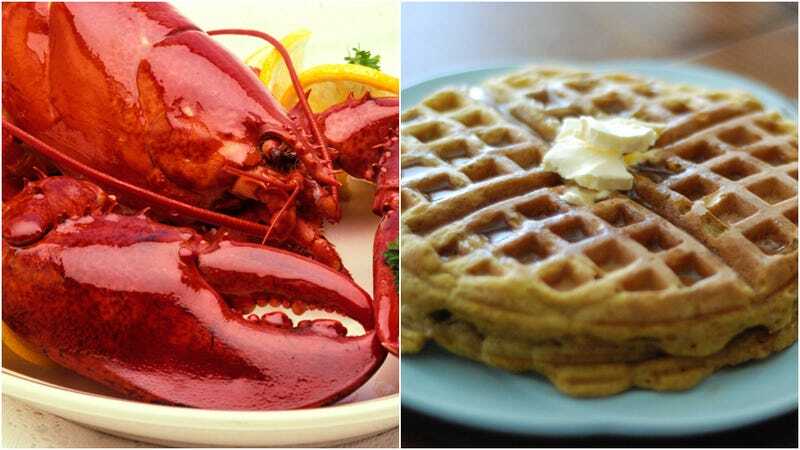 ), ABC News and several other outlets are reporting this week that in honor of the annual Lobsterfest promotion, the chain will offer its own version of “chicken and waffles”: fried lobster on a Cheddar Bay waffle for a limited time. We at The Takeout, however, have no such conflicts, and will be heading to Lobsterfest to try this dish out as soon as humanly possible.